Dental bonding is a procedure in which a tooth-coloured filling material is applied and hardened with a special light. This bonds the material to the tooth and helps changes its shape to restore or improve the patient’s smile. Bonding is often a feasible option for repairing cracked, chipped or disfigured front teeth. It may be a better way to change the shape, size and position of teeth. It is a lot less expensive and much faster than the regular orthodontic treatment or braces. The dental bonding process is relatively simple. When cosmetically enhancing front teeth, sedation dentistry is usually not needed, and it is possible to complete your newly enhanced smile in a single visit. Bonding can improve the appearance of your teeth by filling in spaces, imperfections, chips, and any irregularities. This patient was conscious of the gaps between her teeth. She came to Sterling Dental Clinic for a solution. She wanted the treatment to be cost-effective, simple and non-invasive. 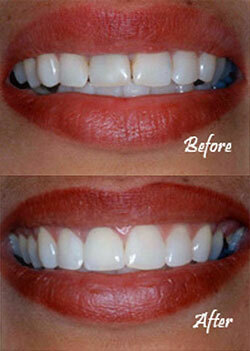 Bonding on the front four teeth was an easy decision and once again, small changes made for an excellent result. The dental bonding solution can be expected to last around five to seven years or even more depending on location and size. It is suitable for smaller areas that need enhancement. For larger and stronger enhancements, we may recommend porcelain veneers as the better alternative. When you come to visit Sterling Dental Clinic, together we will decide what cosmetic dental solution works best for your case.